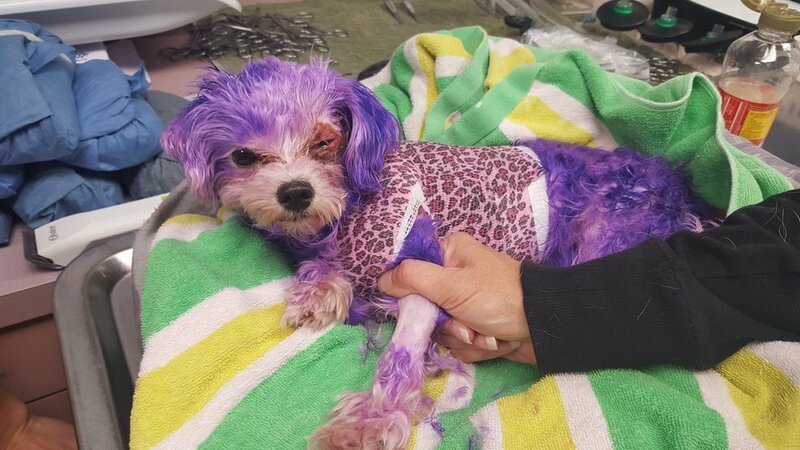 “Violet was dyed with purple hair dye that was intended for humans and as a result her eyes swelled up, she was limp and listless, and she had burns to her skin. Perhaps I may be coming off really judgemental but I don’t think so. I’ve had people debate me or question my decision for dressing up my pups in clothing/accessories but this is so different. For one, my pups actually like dressing up. My boy thinks he can wear all his clothes at once, it’s the cutest thing! Some states have laws that make it illegal to dye animals. These laws seem to have been put in place to protect rabbits and birds from being dyed around Easter but from my understanding, it could also be applied to domesticated pets such as dogs. If you’ve ever dyed your hair, you’ll know that it can burn your scalp sometimes. The fumes alone are so strong, so that is why I’m confused as to why someone would think it was okay to put dye on an animal? Thank goodness Violet made it and lived. The road to recovery is long and three months later she is still healing.